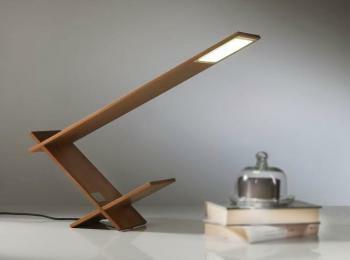 The K Blade is a new OLED lamp from Italian designer Riva 1920. It is made from New Zealand's Kauri wood and has a single Philips OLED panel. Reportedly the OLED brightness is "over 200 lumens", which is strange as the GL350 Gen-2, Philips' brightest panel, is only 200 lumens bright. Maybe they are using a new panel (the GL350 Gen-3, perhaps? although an earlier report suggested it will feature 300 lumens). The K Blade is actually an affordable OLED lamp - it costs €560 and I think it is now shipping.